Hot on the heels of War for Cybertron, Activision is in negotiations with High Moon Studios to work on more Transformers games. Up until now, the Transformers games have been a lot like the Michael Bay films: They're either forgettable bubble gum experiences or pretty terrible. 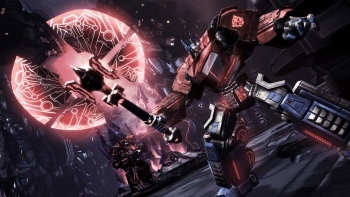 High Moon Studios came out of nowhere with Transformers: War for Cybertron, which — as John Funk noted in his review — is a ton of crazy fun. In some welcome news for Autobot and Decepticon fans, the developer has revealed that it's talking to Activision about working on more Transformers titles. Speaking at BotCon, developers Aaron Archer and Matt Tieger (who work at High Moon) revealed that the future of the series isn't set in stone, but they're working with Activision to develop more games starring everyone's favorite giant robots. "We are talking with Activision about the future," Archer stated. "Please buy the game to support it." Archer proceeded to make a statement that will undoubtedly set the internet on fire, saying he'd like to make a Twisted Metal-like game starring the Transformers. "My job is to listen to fans, Hasbro, gamers about what people want," he said. "I filter by what's achieveable and what makes sense for story. I can't say yes or no but as we move forward, we will put what's right for the game in the game." A combat racing game set in the Transformers universe sounds like a killer idea, but I'd be happy to just see another Transformers game helmed by High Moon. If you're a fan of the cartoons and/or movies but haven't played War for Cybertron, go out and pick it up.